Twinkling in the winter sky just before dawn, Matariki (the Pleiades) signals the Māori New Year. Traditionally, it was a time for remembering the dead, and celebrating new life. In the 21st century, observing Matariki has become popular again. Heaven-bound kites, hot-air balloons and fireworks help mark the occasion. 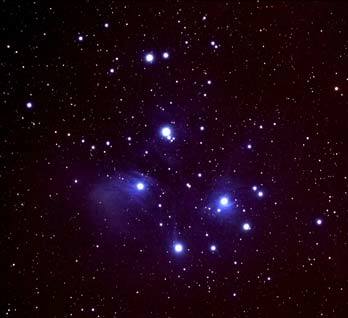 Matariki is the Māori name for the cluster of stars also known as the Pleiades. It rises in mid-winter and for many Māori, it heralds the start of a new year. Matariki literally means the ‘eyes of god’ (mata ariki) or ‘little eyes’ (mata riki). According to myth, when Ranginui, the sky father, and Papatūānuku, the earth mother, were separated by their children, the god of the winds, Tāwhirimātea, became so angry that he tore out his eyes and threw them into the heavens. Traditionally, Matariki was a time to remember those who had died in the last year. But it was also a happy event – crops had been harvested and seafood and birds had been collected. With plenty of food in the storehouses, Matariki was a time for singing, dancing and feasting. Matariki, or Māori New Year celebrations were once popular, but stopped in the 1940s. In 2000, they were revived. Only a few people took part at first, but in just a few years thousands were honouring the ‘New Zealand Thanksgiving’. A special feature of Matariki celebrations is the flying of kites – according to ancient custom they flutter close to the stars.